Posted On June 28, 2016 by &filed under Corporate & Commercial Law, Legal Articles. The Companies Act, 2013 (“Companies Act”), while beneficial, has also been perceived as overzealous over regulation in part. With a view to facilitating the ease of doing business in India, addressing stringent compliance requirements, harmonising company law with other regulations, the (“Bill”)was introduced in the Lok Sabha in March 2016 and is currently under review by the Parliamentary Committee on Finance. We present below, a brief summary of a few pertinent amendments proposed by the Bill. Generic Objects Clause: The Bill proposes to dispense with the listing of specific objects in the Memorandum of Association and permits a universal objects clause i.e. “to engage in any lawful act, activity or business”. Only if the company prefers to restrict its activity or objects, will specific object(s) be required in the MOA. This is seen as a positive change in keeping with today’s fast changing business landscape. CSR: Currently CSR compliance in the current year is required where the net worth, turnover or net profit exceed the thresholds in any financial year. The Bill clarifies that CSR compliance will be mandatory only where the thresholds are met in the immediately preceding financial year. Further, unlisted private companies only require two or more directors to constitute their CSR committee, and will not require an independent director. Unfortunately, the Bill also allows for certain sums to be excluded in the computation of ‘net profit’. This may be a cause for concern as it may significantly increase the actual amount to be spent on CSR activities. Sweat Equity to be issued anytime: It is proposed to permit issuance of sweat any time post incorporation of a company without the earlier mandatory waiting period of one year post incorporation. Start-ups and small companies will find this a useful tool to acquire and retain senior talent. AGM of Unlisted companies can be anywhere in India: Currently AGMs are to be held in the same city, town or village as the registered office of the company. The Bill proposes to permit unlisted companies to hold their AGM anywhere in India,if consented to by all members. Shareholder meetings can be outside India: Extraordinary General Meetings (EGMs) are currently required to be held only within India. The Bill, proposes to permit EGMs of an Indian company which is a wholly owned subsidiary of a foreign company, to be held anywhere in the world. Unfortunately, AGMs of such companies still need to be held within India even where all the shareholders are outside India. Voting through Postal Ballot and electronic voting: This amendment will enable items of business currently required under the law to be transacted only by postal ballot to also be transacted through electronic voting at general meetings. Video Conference meetings:Currently, the Board may conduct meetings via video conference except on prohibited matters which require a physical meeting. The Bill now clarifies that if the minimum quorum is physically present, the remaining directors may attend via video conference even on these restricted matters. If Shareholder numbers fall below minimum: The Bill proposes a six month period to cure any shortfall in the minimum number of shareholders (i.e. two for a Private Company and seven for a Public Company). Beyond such six month period, the remaining shareholders who were aware of such shortfall in minimum shareholders shall be severally liable to bear all the debts of the company contracted during such period. Committees only for listed public companies: Currently all listed companies (even private companies with debt listing) are required to constitute N&R Committees and Audit Committees. The Bill proposes this only apply to listed public companies, not to private companies. Management remuneration exceeding 11%:It is proposed to delete the requirement for a public company to obtain central government approval prior to payment of management remuneration exceeding 11% of net profit. Independent Director can have limited pecuniary interest in Company: The Companies Act currently prohibits an Independent Director having any pecuniary relationship with the company. The Bill proposes to permit an independent director to have a pecuniary interest in the Company of up to 10% of his total income, without being liable to disqualification as an independent director. Disqualified Director to vacate office in all other companies:The Bill proposes that any director of a company that has not filed its financial statements or annual returns for a continuous period of three financial years or failed to file its financial statement or annual returns, failed to repay deposits, redeem debentures or pay dividend etc., will immediately be disqualified from directorship in all other companies in which he is a director, other than the contravening company. This may act as a serious deterrent. Deletion of restriction on investment through not more than two layers of investment companies: Post the amendment, companies will be able to invest through any number of layers of investment companies. 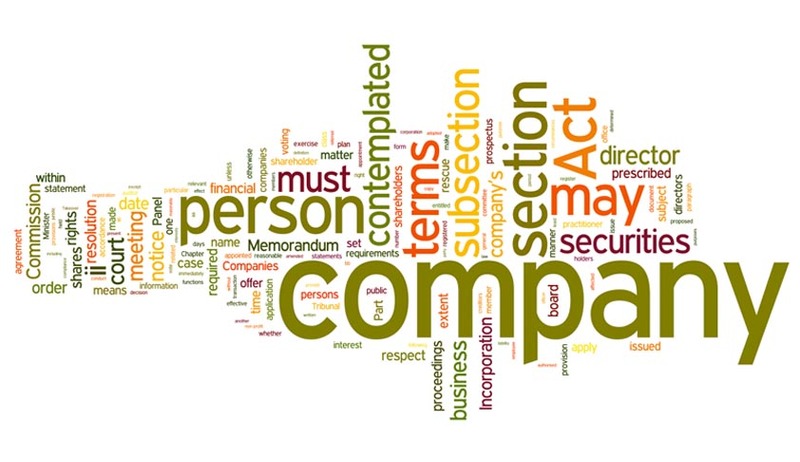 Given that companies will need to maintain a beneficial ownership register as set out below, concerns about declaration of ultimate beneficial ownership stand addressed. Register of Significant Beneficial Ownership: The Bill has created the concept of ‘significant beneficial ownership’ (i.e. alone or with others holds beneficial interest of 25% or more in the shares or significant influence or control). Persons holding /acquiring such significant beneficial interest are required to declare such interest/change to the company and the company is to maintain a register accordingly. Changes on Related Party Transactions: Currently, companies are prohibited from entering into certain related party transactions except with a special resolution and members who are related parties are not permitted to vote on such resolutions. The Bill proposes to do away with the restriction on voting by relatives for companies in which 90% or more members, in number, are related parties. Deletion of Forward Dealing and Insider Trading provisions: The prohibitions on Forward Dealing in Securities and Insider Trading are proposed to be deleted and will be inapplicable to private companies. Public / listed companies will need to comply with the relevant SEBI regulations in this regard. No consolidation: The current requirement of consolidating accounts of joint ventures is proposed to be omitted. Conclusion:The Parliamentary Committee continues to receive recommendations on the Bill and the question remains whether the above changes will in fact see the light of day as law. It is hoped that the Bill once passed, eases the conduct of business in India. 101 queries in 0.201 seconds.